Home >> Providers >> Vafa Rekaby, M.D. 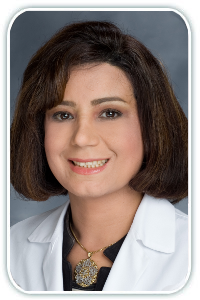 Vafa Rekaby, M.D., an honor graduate of the Medical College of Georgia and Jundishapur University of Medical Sciences, has over 20 years of experience in medicine, general surgery, and cosmetic and aesthetic procedures. Dr. Rekaby possesses a unique talent, ability, and ultimate passion in caring for and treating patients of all ages. Dr. Rekaby's interest in medicine started in early childhood while she was growing up in an all-physician family. She entered medical school at age 14, and was a first female honor surgeon. After graduating from the school of surgery at age 25. She joined Jundishapur University of Medical Sciences as Associate Professor of General Surgery and department head. Before joining NAPC in 2014, Dr. Rekaby practiced at Cobb Hospital as the chief emergency room doctor as well as hospitalist and then as the chief medical director at Concentra and American Family Care. She is a general surgeon and is board-certified in family medicine. Dr. Rekaby is a member of the American Academy of Family Medicine and the Georgia Academy of Family Physicians. Dr. Rekaby strongly believes in a preventative approach. Her medical interests lie in treating all patients with special emphasis on comprehensive care and management of chronic and acute medical conditions. Each year, Dr. Rekaby joins a team of fellow volunteer surgeons to perform hundreds of complex surgical procedures needed in rural areas abroad.